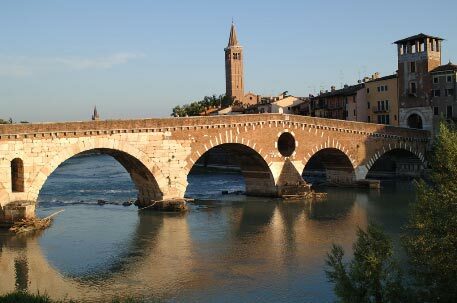 Situated between the two bends of the Adige river, the origins of Verona date back to prehistoric times. It is considered the second Roman city after Rome for its large presence of Roman remains which have been very well preserved, for example the Roman amphi-theatre Arena, the Roman theatre, the two gates Porta Borsari and Porta Leona, the Gavi Arch, the stone Bridge and the Forum, which was the heart of the city’s religious and civil life. In the Middle Ages, Verona was dominated by the Scaligeri family and within a century Verona had become the prestigious capital of the state. Under the rule of Cangrande I della Scala the city walls were extended, the Scaligeri castle and also many important palaces were built. 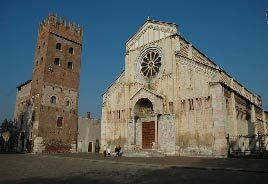 Next to the palaces, the splendid Scaligeri graves were erected, a masterpiece of Veronese medieval art. 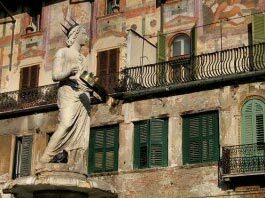 After the fall of the Scaligeri family, for the next 400 years, Verona was dominated by the Republic of Venice and under its rule Verona flourished as an arts and cultural centre. From this period we can today admire beautiful frescos on the walls in the Erbe square and famous noble palaces such as Palazzo Pompei, Palazzo Maffei, Palazzo del Tribunale, Loggia del Consiglio and the Domus Nova in the Signori square.There are also four Renaissance gates from this period: Porta Nuova, Porta Palio , Porta S.Zeno and Porta Vescovo designed by the Veronese architect Michele S. Micheli. During the Austrian Empire walls, forts and fortifications were built together with civil and military palaces, such us the Arsenale and Palazzo Barbieri. 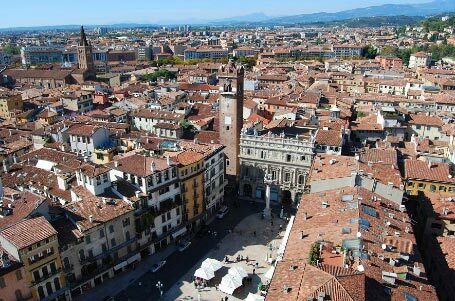 Nowadays Verona is a flourishing city with approximately 300,000 inhabitants and it offers a rich cultural programme to its visitors and inhabitants alike. 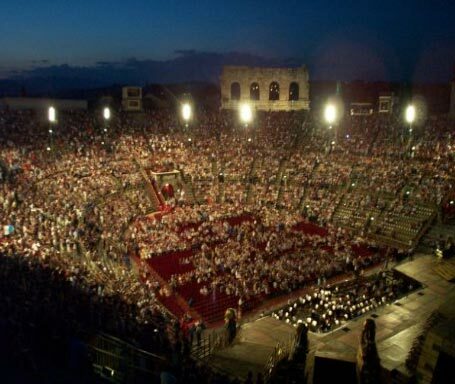 Highlights are the open air Opera’s in the Roman amphitheatre (Arena), concerts and ballets at the Philharmonic and Roman theatre and all sorts of festivals and sporting events.